Feelings of freedom from precedents and “unbridled creativity” are some of the most powerful ingredients for groundbreaking graphic design. Rave culture brought about an almost universal graphic language, which in the decades since its first incarnation has become inextricably bound to its origins, yet transcendent of them. Rave posters of the 1980s and 90s demonstrated a joyful disregard for convention as did anti-design tropes for punk in previous decades. Type was brash and bold, colors a retina-burning neon, and imagery—like the sounds and samples pervading the scene—delinquently cut and pasted together. These original designs served a purpose that’s become all but redundant in today’s world of online promotion: telling people the wheres, whens, and hows of the party. Palettes were bright to reflect their revellers; type was large enough to be read in a chemical daze. Commercial director of branding consultancy Bugler Smith Paul Gosling (no relation to me) has worked with numerous dance music clients in the past, and founded the site Crazy Animal Face, which looks at links between design and illustration and music. Today, he says, artists and clubs aren’t so much looking for posters, but for shareable digital content. When posters were necessarily cryptic, they inspired some of the most interesting graphic design treatments and illustrations, that in time, became a visual shorthand for rave. The most recognizable of these is, of course, the smiley. This cheerful little yellow symbol first emerged in the 1960s, and while its parentage is much contested, the story goes that it was first seen in 1963 on American children’s TV programme The Funny Company. In the same year Massachusetts-based commercial artist Harvey Ball designed a smiley icon for State Mutual Life Assurance, but didn’t copyright the design. David Stern, a designer from Seattle, also claimed he’d created it, and until this day its true authorship remains unproven. 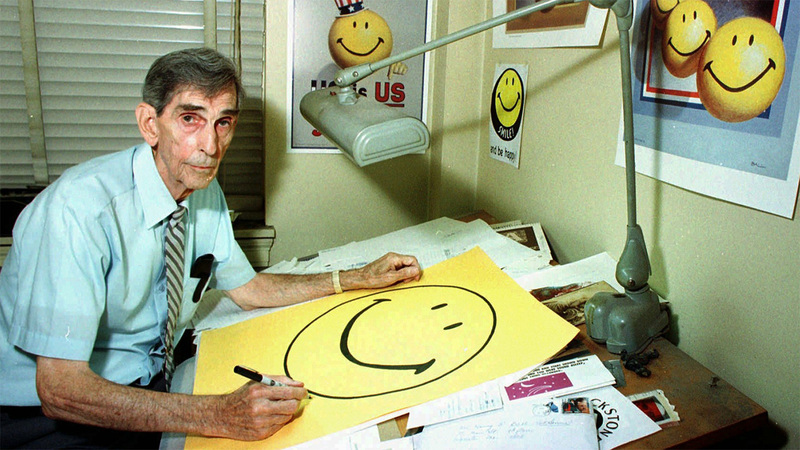 The design shot to wider recognition in the 1970s when Philadelphian brothers Bernard and Murray Spain paired the smiley with the slogan “have a nice day” on badges, selling at least 50 million in 1972 alone. The icon’s place as the face of rave was secured when in 1988, Bomb the Bass lifted it from Alan Moore and Dave Gibbons’ hit comic Watchmen, and slapped it onto the cover of their single Beat Dis. 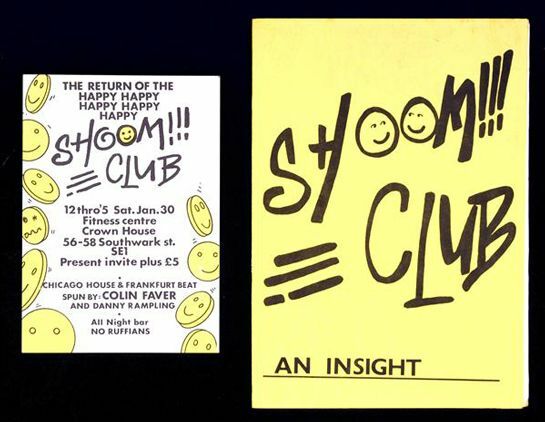 Promoter and DJ Danny Rampling had already used it on his flyers for Shoom, and soon the round yellow icon had morphed between summer of love, pin badge, evil nemesis, and finally to club culture icon. It’s been appropriated repeatedly since, with agencies like Wonder Room making it pink and surprised in its promotional posters for Manchester’s Soup Kitchen venue. Elsewhere, club graphics were characterised by garish palettes and nods to psychedelia. The application of intense, vibrantly coloured patterns was common as an easy visual reference to the experience of tripping. While designers were likely basing designs on their own psychedelic experimentation, there’s a science in using pattern as signifier. In 1926, German and American psychologist Heinrich Klüver studied the effects of hallucinogenic substances on users, and noted that the visuals they experienced were often recurring geometric patterns—dubbed “form constants”—in “highly saturated colors.” This is mimicked in club imagery past and present, and perhaps best demonstrated in Chelsea Louise Berlin’s Hard Times graphic, which makes the pupils dilate in even the most sober viewer. The influence of these works is now seen in modern designers’ client work, as well as more personal party poster designs, like those of Hanse van Halem, who takes a magic eye approach to typography for clients including Wired Germany and Galerie Block C in Groningen. French design agency Alles Gut’s work for Laurent Garnier uses similar ideas of appropriating pop-art imagery and icons, as does another French agency Twice Studio’s adaptable identity for art and music festival Baleapop. German designer Mark Bohle’s poster designs for clubs also nod to rave culture past, with a mix of surreal imagery, bright colours and hand-drawn type that creates beguiling and unusual final pieces. At the mainstream end of the spectrum London agency Zak Group has just unveiled its typographic designs for Frank Ocean’s new visual album, Blond, released with an accompanying magazine, Boys Don’t Cry. The type treatment is a 21st Century version of rave culture’s off-the-cuff, cheaply reproduced imagery, utilizing lettering warped by repeated scanning, the glyphs deliciously morphing into one another, their colors forming a grotesquely beautiful prism of tones. Thanks to the nature of early raves—mostly underground, often illegal—little photographic evidence has survived of revellers, despite how recent the movement. As such, alongside the fashion, the most visible and distinct visual reference points of the era are its fluorescent graphic signifiers. These frequently make their way into today’s contemporary art, as in Jeremy Deller’s wry Bless This Acid House print, which manages to straddle alternative drug culture and prosaic domesticity. During the mid-90s, the artist also created a series of posters promoting fictional events; one advertised an exhibition on acid house at the Tate gallery in Liverpool, which of course never existed. Recently, Deller worked with London-based graphic designer Fraser Muggeridge on the identity for the city’s Utopia exhibition at Somerset House. The visual language was centred round a pink and yellow smiley icon, a telling move that proves the pervasive nature of rave’s imagery on today’s graphic storytelling. The sense of freedom and a wilful naivety in approaching graphics is what made the imagery of rave culture so pure, fresh, and enduringly striking. There were no rules, but plenty of hedonism. Walter Van Beirendonck, a Belgian fashion designer whose outré outfits came to define late 80s club dress, tells an interviewer for Rave and Its Influence on Art and Culture, “The only limitation was the technical one. We had to search for things, to find solutions…It was a strong feeling of freedom I had at that time.” From the effervescent sampling in the music, hand-me-down fashion to the eye-watering posters and flyers, there’s a sense that nothing was visually off-limits. For a few short years, design experienced a sort of chemically enhanced utopia that modern graphic designers are now trying to recapture.